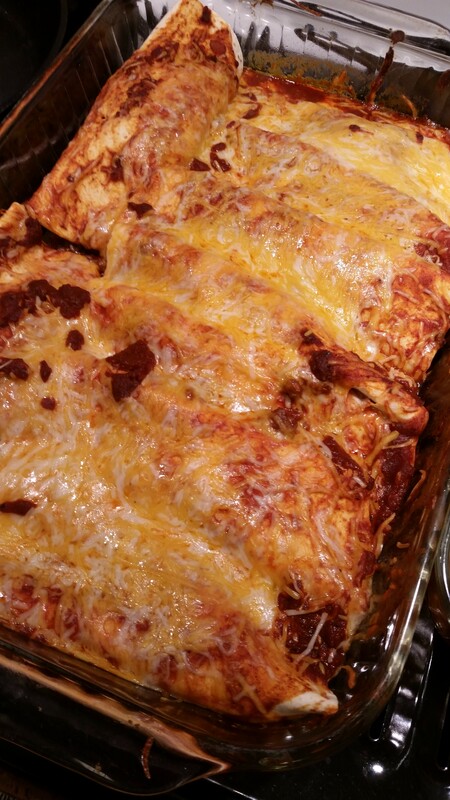 Enchiladas Two Ways- Carnivores and Vegetarians Unite! So this morning I got up and got ready for work. I went to wake up the girls. Becca got up and started getting ready. Katie was still sleeping, which is unusual for her. She usually pops out of bed and gets ready faster than Becca, so I went in to check on her. She was still sound asleep. I bent down to wake her up and she was burning up. Poor baby! So I let her sleep in and got Becca on the bus. After she woke up, her fever had broken and she seemed a bit better. She has had a cough and runny nose the last couple of days, so I ended up taking her to the doctor to get checked out. Turns out she has a pretty gross sinus infection; after getting some meds, we came home and rested and snuggled for a bit on the couch. Then we went to pick up Becca and they ended up playing together outside. I sat outside and read a book while they played. It was a nice afternoon. For dinner I planned on making beef enchiladas. 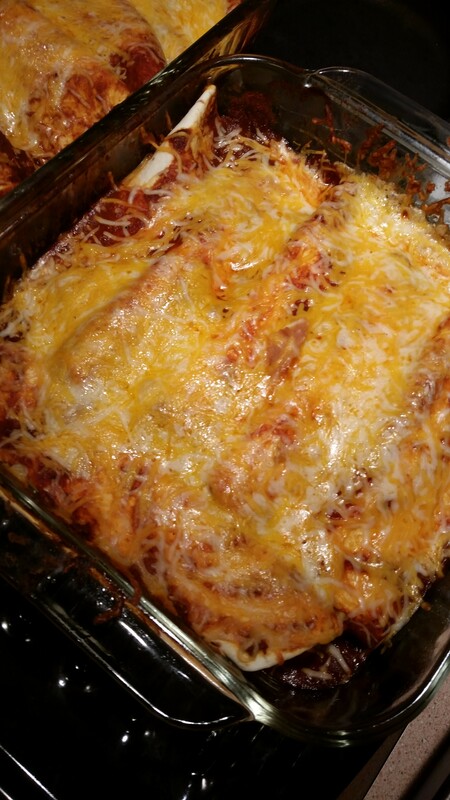 Then I saw that I had an extra can of refried beans in the pantry, so I ended up making bean and cheese enchiladas as well. Both of these were super easy to make. Nothing fancy or any extra veggies; just strait up beef and beans. Oh, and lots of cheese, of course! Add your seasoning to the beef as you cook it. Add about 1/2 cup water over the heat until it absorbs, about 5 minutes. Cool. Put a small amount of enchilada sauce on the bottom of the pan. Cook for 25 minutes or until cheese is melted. Plenty of leftovers in the freezer for another meal!